Membership in the Lincoln Club of San Bernardino County has excellent benefits that support your annual investment! 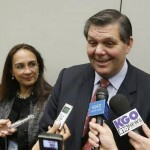 STOCKTON, Calif. (AP) — What they lacked in policy distinctions the two Democrats vying for California’s first open U.S. Senate seat in decades made up for in stylistic differences, with front-runner Attorney General Kamala Harris sticking to an attorney’s measured tones and Rep. Loretta Sanchez shooting from the hip and milking every moment for a quip. 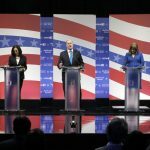 In Monday night’s debate, Harris and Sanchez agreed on the need to create path to citizenship for people living in the United States illegally, on restricting access to weapons for those with a criminal record or history of mental illness and on the need to provide free community college education. 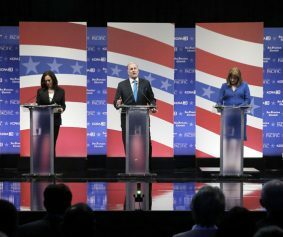 The debate between five leading Senate candidates, Democratic and Republican, at the University of the Pacific in Stockton, delivered no major gaffes, no knockouts and no zingers, instead giving voters a look at the contrasting personality styles of Harris and Sanchez and the three Republicans trying to edge their way into California’s primary. “We need reasonable, practical leaders who realize that it is not all or nothing,” when it comes to weapons, Harris said. Harris, a career prosecutor who has been anointed by the Democratic Party establishment, leads in fundraising and in polls, leaving the contest largely as a race for second place. Under California’s top two primary rules, the top two finishers will advance to November’s ballot, regardless of their political party. “If somebody has been convicted of a felony that proves them to be a dangerous person, they should not be able to own a gun. If somebody has been found by a court to be mentally ill to the point that they are danger to themselves or other people they should not be able to own or possess a gun,” she said. With only six weeks remaining until the primary, former Republican party chairmen Tom Del Beccaro and Duf Sundheim and physicist and entrepreneur Ron Unz are all trying to edge their way into voters’ minds as they vie to replace retiring U.S. Sen. Barbara Boxer. Sanchez, a firebrand from conservative Orange County, played up her roles as the second-ranking Democrat on the House Armed Services and Homeland Security committees. The two parted slightly on the issue of foreign policy, where Harris, when pressed, said she supports the Obama administration while Sanchez said she has given the president a piece of her mind on “where he could do more and where he could do better,” though she did not specify what those areas were. 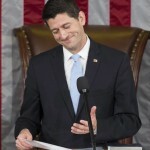 The three GOP candidates all sharply differed with Obama on national security, arguing that the U.S. administration has taken a failed approach in the Middle East. The moderators also asked Sanchez about her track record of colorful language, which has at times included comments that some found offensive to Native Americans, Muslims and others. Sanchez said the comments were largely taken out of context, but acknowledged she has a colorful personality. “With respect to how I am, I come from the people, I am of the people, I want to be with the people,” she said. The race was expected to attract outsize attention and a strong field of candidates, but polls show about half of likely voters remain undecided about whom to support and there will be 34 candidates on the ballot. A Field Poll earlier this month found Harris in the lead with support from 27 percent of likely voters and Sanchez with 14 percent. Unz, Del Beccaro and Sundheim were all within the poll’s sampling of error margin of plus or minus 4 percentage points. Del Beccaro used his highest profile opportunity to date to take a few shots at Harris, criticizing her Department of Justice for raids earlier this month against an anti-abortion activist who made undercover videos at Planned Parenthood clinics. Harris later told reporters the raid was justified and she is doing her job as the state’s top law enforcement officer. Unz, who is best known for backing a 1998 initiative to end bilingual education in California, took several contrary positions during Monday’s debate, including support for the state’s recently approved $15 an hour minimum wage, serving to highlight how far the largely Democratic state is from the national political debate. 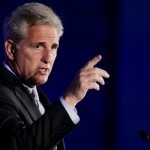 “We have to be honest about something: It’s going to be very difficult for any Republican to win the senate seat in California these days,” he said. Democrats are strongly favored to retain the seat in November. The party controls every statewide office and holds a 2.7 million edge in voter registration.